Backlit displays are the newest trend in trade show exhibiting. They work by taking a standard display and incorporating light strips to create a glowing backdrop. Backlit display systems will make your booth stand out at any event and draw in a crowd! Every backlit system works as a standard display so if electricity is not available the display is still functional! Backlit Embrace Displays use SEG graphics and and easy to assemble pop up display frame! We offer multiple sizes and each kit includes a hard case! Vector Frame light boxes are a clean modern solution to trade show exhibiting. We offer many sizes as well as custom configurations! Backlit Hop Ups come in 10 foot, 8 foot, and table top options! Every kit includes a full color graphic, block out liner, and back lighting kit! We offer two backlit display systems: the Hop Up and Vector Frame light box systems. The Hop Up backlit display utilizes our very popular Hop Up display system with an engineered lighting system. Right now this model is only available in a curved shape. Every kit includes the full color graphic, hard shipping case, block out liner, and the LED lighting kit. 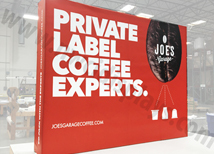 We offer even more sizes and shapes in non backlit versions including custom 30 and 40 foot wide models! 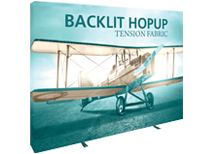 Lead time on our Hop Up displays is 4 business days and this product also qualifies for free rush production if shipped overnight! The Vector Frame light box system is the most versatile back lit display. It's available in multiple sizes and can be used as a single or double sided display. It works great as a non backlit display and can be customized to virtually any size! 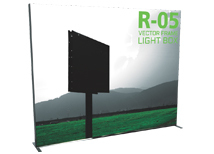 The Vector Frame system offers the most modern look out of any standard portable display. From the front it looks frame-less giving it a super clean look. The back-lighting system only adds to the appeal of the display and makes it stand out from any other booth!